After a busy summer helping newspapers all over the U.S. drive major revenue in spite of the economy, I thought I'd share another example of our techniques in action. Once again, it was a local non-believer that a client newspaper turned into a major one--with equally major success for the advertiser. This ad is a recent one from a publication owned by Pioneer Newspapers, a company that's committed to proving to their advertisers that they're more than just a great medium in which to advertise--their ad reps can also affect response with killer ad strategies and designs. 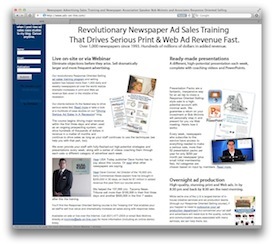 Using our selling system, their ad reps are learning how to teach prospective advertisers our easy-to-understand but epiphany-triggering approach to getting an immediate, dramatic response. This makes it much easier for a prospect to believe in the new ad strategy and commit to a significant size and frequency when they previously had believed the problem was with the newspaper or the economy, for example. This ad is a 5 col. x 18 ad for a flooring store that sold on a 13-time, $15,000+ contract. It was designed by my overnight production service based on a strategy we gave them (if your ads aren't coming back from your designers overnight and looking as good as the national chains, I can help). The Idaho State Journal's ad director Michelle Robinson shared that the very first time this ad ran--a couple of months ago in the dead of summer--their flooring dealer had the biggest weekend in the history of their store. The prospect had been saying the exact same thing I'm sure your own prospective advertisers are telling you--they had no money, it's a recession and nobody's buying, print is dead, and the publication just doesn't work anymore. If you think there's no way you'd be able to get your advertisers to run this big and this frequently, perhaps you're using the same ad sales techniques that have been circulating for years. "Just sell the media and let the designers come up with that minor detail of the ad strategy," is what other ad reps told me when I first started. Working on ad strategy was considered a waste of time and more of an art project better done by someone else. But I have hundreds of similar case studies in the past few months that my clients have closed using my techniques in markets as challenging as yours, and sold without any pressure. It's incredibly easy once you learn how. The strategy in this ad was to grab the attention of everyone thinking of buying new flooring, get them reading on with the right benefit headline (price, selection, and service in this instance), and then get into enough detail that their target customers--people about to install flooring--are confident enough of their advertising claims to go to them instead of where they may have been thinking of going (the big home centers, for example). The strategy is incredibly simple and with the right designers who can give those national ad agencies a run for their money, it's a killer combination. So, in this recession, the newspapers who are getting their prospective advertisers to spend any serious money and succeed with print and Web realize simply talking about the medium is not enough anymore. To these local businesses who are trying to choose between paying their rent or spending money on something as unpredictable as advertising, running with a newspaper whose ad reps can create and prove the effectiveness of the ad strategy is a no brainer.